Have a look at these pictures of Kenya people: top images made by the best photographers of both traditional and modern Kenya. At the bottom of this page are links to the other pages with pictures of Kenya people at this website. 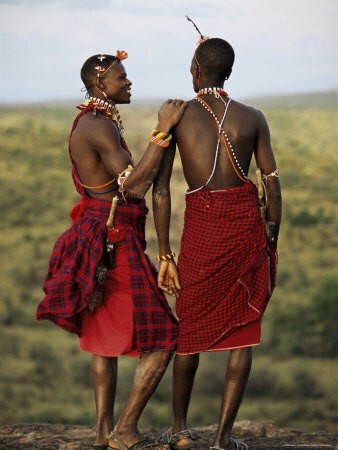 Above: Traditional Kenya: two warriors of the Samburu tribe. The Samburu, Turkana and Masai are among the tribes who have by and large kept their traditional way of living. Above: Modern Kenya: most Kenyans have adopted more or less Western lifestyles. This goed especially for the Kikuyu (the biggest tribe which dominates Kenyan politics and business), the Luo and the Luhya. 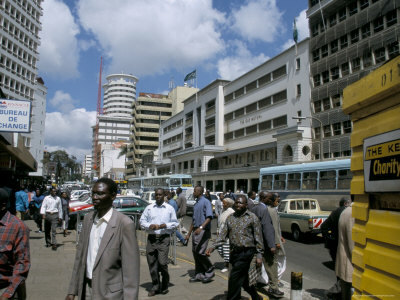 This is Moi Avenue in the city centre of Nairobi. 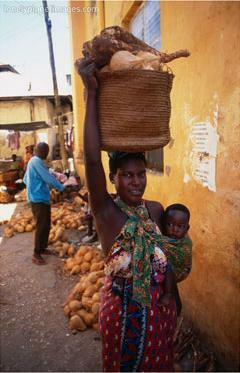 Above: Mombasa – a woman carrying her baby and a basket. Above: Members of the Masai tribe involved in a ritual dance, in the Rift Valley. 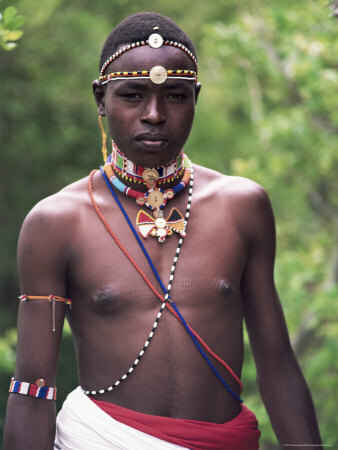 Above: A young Samburu warrior. 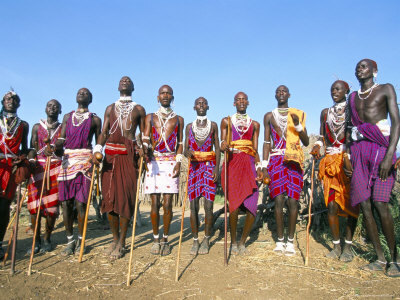 The Samburu and Masai tribes are closely related. Their language – which is the main criterium to distinghuish tribes and groups of tribes from each other – is 95 percent the same. 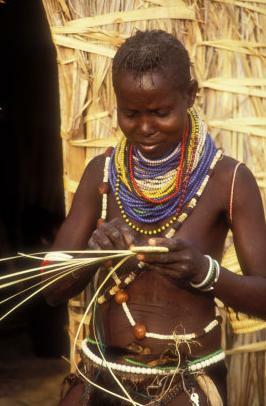 Above: A woman of the Turkana tribe is weaving, in the Lake Turkana area. Above: In the coast region, about a third of the population is Muslim. This is because of the trade, since the 9th century on, with the Arabs across the Indian Ocean. Here you see a Muslim woman on the island of Lamu. 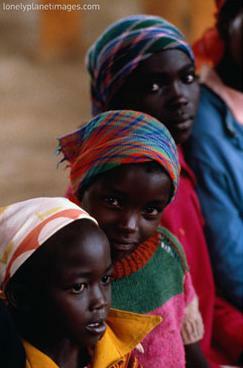 Above: Kenyan girls attending Sunday school in Nairobi. Kenyans are very religious people. The big majority of them are Christians, although most combine this with more traditional beliefs. 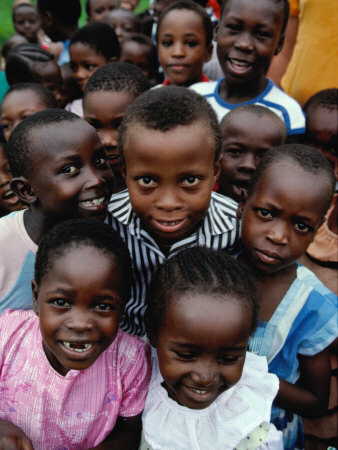 Above: School children in Mombasa, Kenya’s second city at the coast. 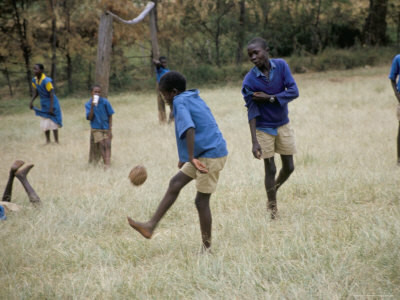 Above: Children in school uniforms playing soccer in West Kenya. Soccer is very serious business in Kenya. During important soccer games, streets are deserted. The many without a television watch the game in a pub.